Japanese manga and anime seem to be able to make even the most mundane tasks, like baking bread, into something that is very entertaining. 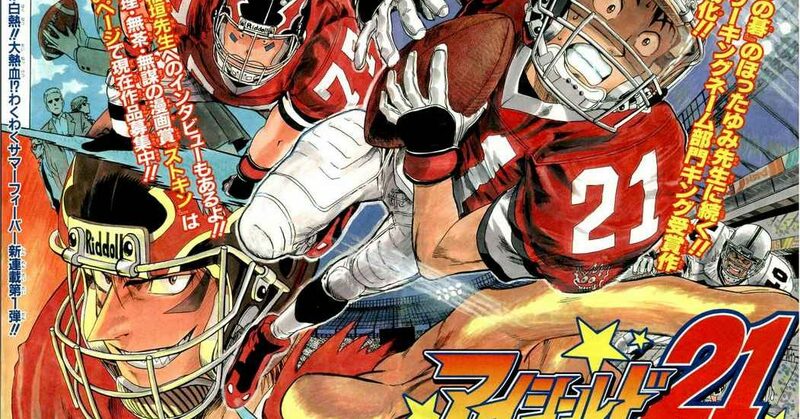 Eyeshield 21 is something that is startling and outside the norm, a manga about Amercian football. Soccer aka football to the rest of the world, baseball, judo, karate, MMA and various other sports have made it into manga but a blockbuster hit about American football is very surprising for the Japanese market. Trivia: Eyeshield 21 is a reference to RB LaDainian Tomlinson. Since it’s in the well-saturated sports genre Eyeshield 21 needed to avoid the common pitfalls when it comes to plot and structure of that genre. It succeeded while keeping the core components that make the sports genre entertaining. The MC, Sena Kobayakawa is not your normal Shonen Jump protagonist and is actually the opposite of those loudmouth fighters that populate such series as One Piece or Naruto. There are no fantastic powers, no sudden powerup’s due to feelings, instead, the characters ability all stems from hard work and years of training. Sena is recruited or should I say blackmailed into joining the football team due to his extraordinary speed by Hiruma, who’s distinct look and ruthlessness belies the humor he brings to the series. Kurita, the other teammate is a gentle giant that balances out the main cast for the first volume. Furthermore, the writer Riichiro Inagaki creates a remarkable introduction to American Football by using Sena’s ignorance of the game to teach the rules. Every character introduced has a background story, even the supporting cast is memorable with certain parts being very memorable, like a background character being blackmailed by Hiruma to join the team because he stole the girl classmates underwear during gym. The artwork is a strong point for this series, the panels seem to fly off the page and convey a real sense of motion. A large number of artistic devices is used to convey Sena’s speed and each character has a unique design that makes it easy to tell at a glance who the character is. The translation of this manga is very good, it strikes a good balance between slang and formality. While some may not like how Viz replaces the Japanese sound effects with their English equivalent but with Eyeshield 21 Viz managed to do it well enough that it is virtually unnoticeable. Eyeshield 21 is a great series and if you like football or sports in general give it a try, you can’t go wrong.